An excellent accent for any outdoor area, from large scale commercial use to residential patio furnishing. 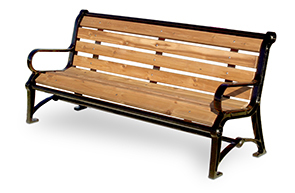 Wood benches are resistant to fungus and bacteria, and have a natural aroma that acts as a bug repellant. The natural color of wood will weather beautifully to a rich silver/gray or it can be stained or varnished.